After a recent series of violent incidents against female students using ride-shares, including the murder of one student at The University of South Carolina, WWU Assistant Police Chief Keith Williams had these important safety tips to consider when using a ride-share service. Buchanan Towers Hall Council is hosting a campus-wide art gala and silent auction, and is looking for artists to submit their work! All mediums will be accepted, including photography, paintings, sketches, and models. A retirement celebration for WWU's Susan Banton will be held from 3-4:30 p.m. on Thursday, April 25 in AC 130A (32nd Street). Please come celebrate Susan's retirement and honor her 15 years of service to Western. For more information contact Mary Seaton at mary.seaton@wwu.edu. In the northwest corner of the Environmental Studies Building’s third floor, a new interactive energy dashboard has been installed by Western’s Facilities Management team. It’s a collaborative effort between Facilities Management, Institute for Energy Studies and Office of Sustainability and was paid for through Associated Students’ Sustainability, Equity and Justice Fund. Books, scores, LPs, CDs are for sale for $1 on Thursday and Friday, April 11 and 12, in the Music Library from 9 am to 5 pm. Come browse and find a bargain! The Music Library is located on the second floor of the Performing Arts Center, in PAC 376. Its growing collection of music contains more than 117,000 items, including books, bound periodicals, musical scores, records, DVD's and compact discs. Listening stations are located throughout the library. 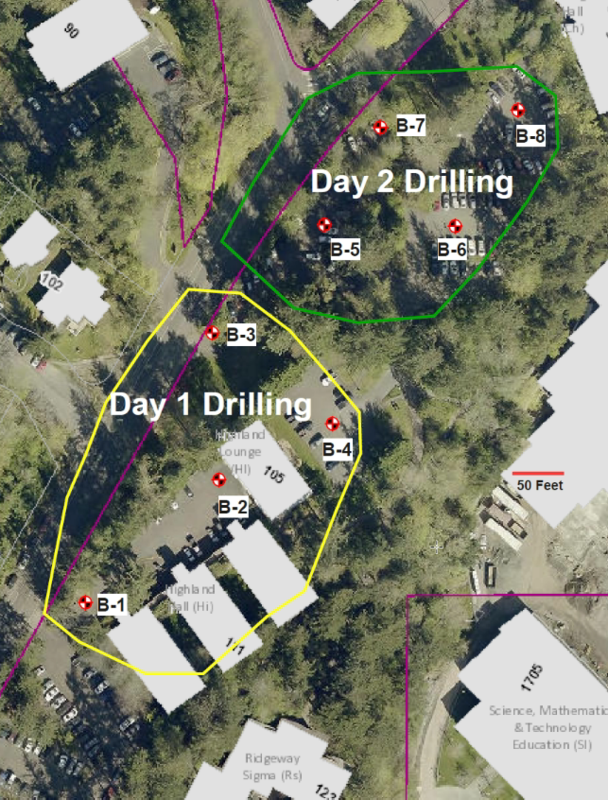 GeoTest Inc. is drilling to perform geotechnical analysis for the New Residence Hall around Highland Hall and nearby parking lots this Thursday and Friday (see map below). Parking Office is working on notifying and moving vehicles out of the lots. Western Washington University plans to test its emergency notification system known as Western Alert at 2:40 p.m. on Tuesday, April 16 and also conduct a campus earthquake drill. Western Alert is a group of ways to reach students, faculty and staff with important safety information. The Student Technology Fee (STF) Committee asks for student, faculty and staff comments on the STF Tech Initiatives proposals for the current academic year. Comments are due May 1. You may review the 11 proposals, which are posted on the STF website, here. Please send your comments by May 1 to the STF Committee at batemad@wwu.edu.